We prefer and accept PDF, AI, EPS files for advertisements. Please no DOC or PUB files. All color ads must be in CMYK Black & White must be greyscale. Minimum size 1 column X 2 inches. All ads must be an equal number of inches in depth as columns wide. Local rates non-commissionable. All SAU sizes accepted. Halftones cut with 85 line screen 6 column width: 12.5 picas/ 2 1/16 inch; Classified: 9 column width. Page: 13” wide, 21 1/2” deep. Double Truck: 26 3/4” wide, 21 1/2” deep, billed at 12 1/2 column width. 14 agate lines per column inch. Half Page Horizontal 10.75" 10"
Half Page Vertical 5.2917" 20"
*Remember* Design all web advertisements in RGB at 72dpi. Take your coupon campaign to a new level, offer your coupons on our Print ‘N Go website. Print ‘N Go users can print the coupons offered on the site right at home. Compete with the large companies offering their deals on sites like Coupon Suzy and Groupon! Copies distributed in over 250 newsstands (rack locations) in and around Springfield/Clark County. Readership estimated at 35,000 per week. The Publisher reserves the right to edit all copy submitted and reject those ads which are not in compliance with state and/or federal regulations, or those which are offensive, false, misleading, deceptive or similarly unacceptable. Alcoholic beverage or tobacco advertisements and ads dealing with the occult, work at home, dietary supplement and 900 numbers are not accepted. Type or cuts will not be set parallel with column rules, backwards or inverted. Full page exceptions are made. 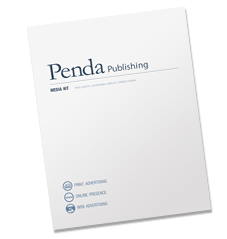 Penda Publishing has an in-house graphic and media design department ready to work for you! We offer design services for print advertising, publications, branding, business stationary, and environmental prints. We also can design your web site from the largest interactive site, to small informative homepages.